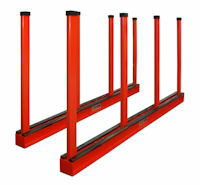 The must have Slab Rack for larger slab yards and fabricators that stores multiple slabs. The Abaco Bundle Slab Rack is designed to store bundles of marble and granite in your warehouse or slab yard. This rack has a total weight capacity of 24,000 lbs. between poles. Poles are 2x4x1/4" and 59" in length. The base rails have wood strips added to the tops to protect your material from chips and scratches. One set contains two base rails and eight poles. ¹ Maximum Weight Capacity Between Poles.